This is the third article in the series of articles on Difference Between Temporary Table and Table Variable. This article provides the Comparative Analysis of Temporary Table and Table Variable based on the aspects like User Defined Functions, Indexes and Scope with extensive list of examples. 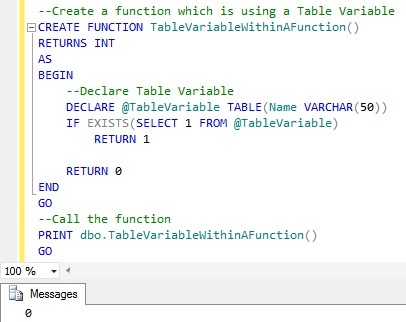 Temporary Tables are not allowed in User Defined Functions, whereas Table Variables can be used in User Defined Functions. DEMO 1: User defined Functions allow Table Variables in it. DEMO 1: User defined Functions doesn’t allow Temporary Table in it. Table Variables doesn’t allow the explicit addition of Indexes after it’s declaration, the only means is the implicit indexes which are added as a result of the Primary Key or Unique Key constraint defined during Table Variable declaration. On the other hand Temporary table supports adding Indexes explicitly after Temporary Table creation and it can also have the implicit Indexes which are the result of Primary and Unique Key constraint. Demo 1: You can add Indexes to the Temporary Table both explicitly and implicitly. Below script creates a Temporary Table #Employee which has Primary Key with Clustered option, it means it will implicitly create a Clustered Index on the Id column. After the creation of the Temporary Table, explicitly adds a Non-Clustered Index IX_#Employee_FirstName on the FirstName column. You can’t add Indexes explicitly to the Table Variable. But as Table variables support Primary and Unique Key constraints, so specifying these constraints during Table variable declaration internally creates Indexes on the Table Variable columns. But as we know both Primary and Unique Key doesn’t allow duplicate values in it (i.e. enforces unique constraint), so they provide means to create only Implicit Clustered or Non-Clustered Unique indexes. It implies Tables Variables doesn’t support adding a Non-Unique Non-Clustered indexes either implicitly or explicitly. Demo 1: Below script creates a Table variable @Employee which has Primary Key with NonClustered option, this means it will implicitly create a Unique Non-Clustered Index on the Id column. And it also has Unique Clustered Constraint on the Name column, so it will create an Unique Clustered Index on the Name column. Scope of the Table variable is the Batch or Stored Procedure in which it is declared. And they can’t be dropped explicitly, they are dropped automatically when batch execution completes or the Stored Procedure execution completes. There are two types of Temporary Tables, one Local Temporary Tables whose name starts with single # sign and other one is Global Temporary Tables whose name starts with two # signs. Scope of the Local Temporary Table is the session in which it is created and they are dropped automatically once the session ends and we can also drop them explicitly. If a Temporary Table is created within a batch, then it can be accessed within the next batch of the same session. Whereas if a Local Temporary Table is created within a stored procedure then it can be accessed in it’s child stored procedures, but it can’t be accessed outside the stored procedure. Scope of Global Temporary Table is not only to the session which created, but they will visible to all other sessions. They can be dropped explicitly or they will get dropped automatically when the session which created it terminates and none of the other sessions are using it. Below DEMOS explain the above explained scoping aspect of the Table Variable and Temporary Tables with extensive list of examples. 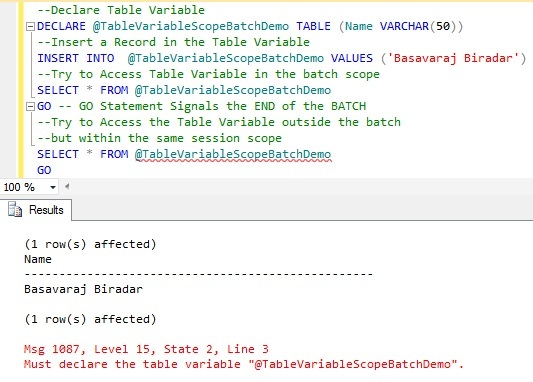 DEMO 1: This example demonstrates that a Table variables Scope is the Batch in which it is created, they are not accessible in the same session’s next batch of statement. 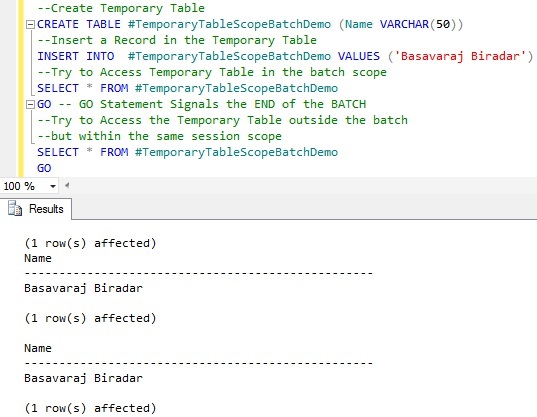 DEMO 2: This example demonstrates that a Local Temporary Table scope is the session in which it is created. Here a local Temporary Table created within the first batch is accessible in the same session’s next batch of statements. 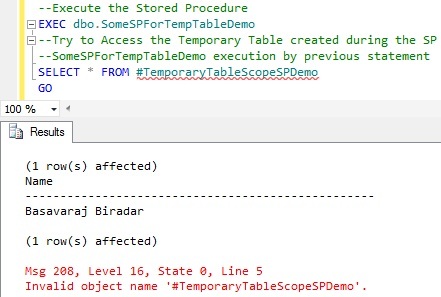 DEMO 3: This example demonstrates that a Local Temporary Table created within a stored procedure can’t be accessed outside the stored procedure scope. 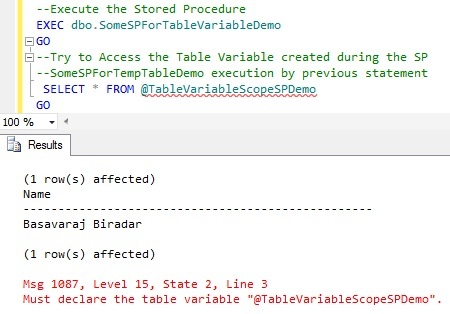 DEMO 4: This example demonstrates that a Table Variable created within a stored procedure can’t be accessed outside the stored procedure scope. Try to execute the above stored procedure which creates a Table Variable and a statement accessing the Table Variable immediately after the Stored Procedure within the same batch as shown in the below script. This results in a compilation error. Try to execute the above stored procedure which creates a Table Variable and a statement accessing the Table Variable created in the SP in separate batches one after another but in the same session as shown below. In such scenario the SP execution succeeds, but the statement trying to access the Table variable outside SP in the next batch errors-out. 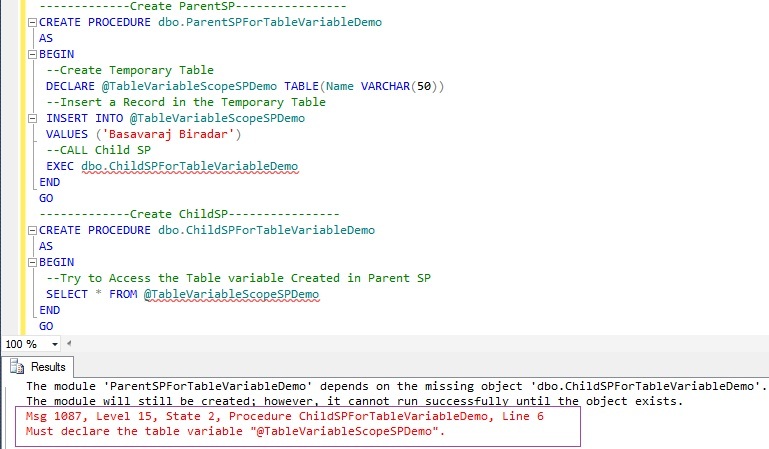 DEMO 5: This example demonstrates that a Local Temporary Table created in the Parent Stored Procedure can be accessed by it’s child stored procedures. DEMO 6: This example demonstrates that a Table Variable Created in the Parent SP is not accessible by it’s child stored procedures. 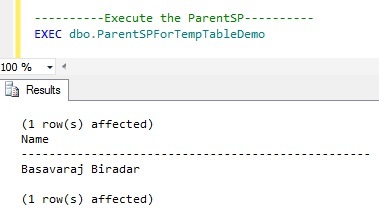 Basically, Sql Server doesn’t allow us to Create a Child Stored Procedure accessing the Table Variable Created in the Parent SP.